One of our favorite things to do is to walk to the park! Of course it is, we have 3 kids under 3 years old! They live for the park. And I love it because it's so fun to play, but they also come home and take better naps after playing hard in the sun. 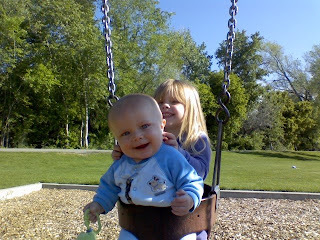 This is a picture of Lezlee and Quince in the swing together. She is so good to her little brother! I love the "wearing" the kids out at the park idea and am glad you got a little bit of rest today! Hope you feel better very soon. happy 5 yrs. Q is so cute, when Dan saw that picture he didn't know if it was Linc or Q.